We have the cute guest teacher, Suzu! 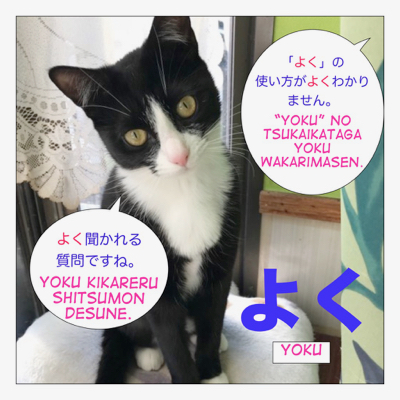 We just had a question in the comment section and she will explain the usage of よく ( = yoku). みなさん、はじめまして！ = Minasan, Hajimemashite! = Nice to meet you! すずです。= Suzu desu. = I am Suzu! = Kono saito ni kuru minna wa nihongo no benkyou wo hontou ni yoku ganbatte iru yo. = All the people who come visit this site study Japanese really hard. She recently got a question about the usage of よく ( = yoku). Yes, it’s true. It is an adverb of いい ( = ii). But the meaning is not just “well”. It can be used in a negative way. = Well done! / Nicely done! = Kono senzai wa shimi ga yoku ochiru. = This detergent removes the stains well. = Kono e wa yoku kakete iru. = This painting is nicely done. = Yoku kangaete kara mono wo ii nasai. = Think carefully before you speak. = Kono geimu wa yoku dekite iru. = This game is nicely done. = Hoomu sutei no kazoku wa mina, watashi ni totemo yoku shite kureta. = Everybody in my host family was very nice to me. = I lost my key. = Are you sure you looked everywhere (carefully)? = Did you pass JLPT? Wow! Good job! = Kanojo ga inakute sabishii (or samishii) kimochi wa yoku wakarukedo nanka, tabetara? = I understand you miss your girlfriend (or you feel lonely because you don’t have a girlfriend) but you should eat something. = Wasure mono ga nai ka yoku mite kudasai. = Look around carefully to see if you have everything. = I can’t hear what you said well. = Kono mise yoku kuru no? = Do you come here/this place often? = Kodomo no koro wa, chichi to kyacchibooru wo yoku shita monoda. = When I was a boy I would play catch with my father. = Kono goro, kare to yoku kenka wo suru. = I’ve been fighting with him a lot recently. = Saikin, maji 卍（manji）toiu kotoba wo yoku kiku. = I’ve been hearing the word, “maji manji” a lot recently. Note: 卍 (manji) is a slang word among teen girls. Originally the symbol of 卍 is a temple which is called “manji”. It doesn’t have a specific meaning and you use it to express emotions or describe one’s state when you feel sad, happy, angry, OK or see something cute, cool, etc. It is like another slang word ヤバい ( = yabai) and it can be used both positive and negative meanings. = You are pretty, Maggie. = Yeah, I get that often. = You drink a lot, don’t you. = Kanojo wa yoku shaberu. = She talks a lot. = Yoku warai, yoku neru koto wa kenkou ni ii. = Good laugh and good sleep are the keys to staying healthy. = Watashi wa chichi ni yoku nite iru. = I look a lot like my dad. = Kare wa yoku hataraku. = He works hard. or He works a lot. = Saikin, kanojo to yoku LINE ( = rain) de hanasu. = I’ve been talking to her a lot on LINE. = Tooi tokoro kara yoku kite kuremashita. = Thank you for coming all this way. = Thank you for coming! = “Yoku (zo) itte kuremashita. = Well said. / Thank you for saying that. = Yoku (zo) kono shigoto wo hikiukete kuremashita. = Thank you for taking on this work. = Kono shigoto wo hikiukete kurete arigatou. Also よく ( = yoku) implies taking on that job is not an easy thing to do. = Yoku kangaete mitara ryokou ni iku okane nado nakatta. = Katta bakari no sara wo yoku mitara hibi ga haitte ita. = When I examined the plate that I had just bought carefully, there was a crack in it. = Yoku kiitara, shiken wa, ashita datta. Note: You also use よくよく ( = yokuyoku) very carefully, very closely to emphasize the meaning. = Yokuyoku no koto ga nai to jikka ni wa kaeranai. = I don’t go my home (my parents’ house) unless there is a special reason. = Kare ga watashi ni okane wo karini kuru nante yokuyoku no koto da. = He must be in a bad state if he’s coming to me to ask for money. = Yoku sonnani taberareru ne. = Wow, you eat a lot, don’t you? = Ano futari, yoku tsuzuite irune. = They (referring to a couple) have been together for a long time, haven’t they? = Yoku mo maa kono samui naka, kooto mo kinai de arukeru ne. = Yoku mo maa nukenuke to koko ni koraretana. = You have a lot of nerve to come here. = Yoku sonna koto ga dekirune. = Wow! How could you do something like that? It implies that you are very impressed. It’s a compliment. But this sentence can be used when you accuse someone as well. You just find out your friend was cheating on his girlfriend when she was away. = How could you do that (to her)? = How dare you do such a thing. = Nani mo shinai noni yoku monku ga iemasu ne. = You don’t do anything. How could you complain? = Oh that’s funny (sarcastic) / Yeah, right. / Look who’s talking! This is another expression that you have to change the translation depending on the context. = Jibun de iu nomo nan dakedo, boku wa, atama ga ii dake ja nakute kakko ii yone. = It may sound strange to say this about myself but I am not just smart. I’m also pretty cool, right? = Kore ijou, taberu to buta ni naruyo. = Don’t eat anymore. You are going to be like a pig. = Yoku iu yo. Jibun datte raamen nihai tabeta kuseni. = Look who’s talking. You had two ramen, too! = Yoku mo sonna hidoi koto ga ieru ne. = How dare you say such a horrible thing./ How could you say such a horrible thing? = Yoku mo sonna koto shite kureta na. = How dare you do things like that. / How could you do that to me? = Yoku mo damashita na. = How dare you trick me / How could you trick me? = Thank you, Suzu sensei! = Mada chiisai no ni yoku ganbatte ressun shite kuremashita!! = I know you are still little but you did a good job making this lesson! My supporters can access an audio file for this lesson on my Pateron page. Do I say “yoku maigo ni naru” or “maigo ni yoku naru” ? Both are OK. If you want to emphasize “often”, you start the sentence with “yoku”. Woops! little mistake here, I meant to write 教えてくれたありがとう. I’m reading manga and came across よく whose meaning I’m not sure of and was wondering if you could help. Half of me is leaning towards gratitude while the other is leaning towards disbelief, could you shine some light on this? B was surprised how well A manages people based on what A says, (I am not doing anything). I was leaning towards that option a bit more so I’m glad to have received the confirmation. Thank you for the quick reply! So another usage of the particle も is to stress the meaning. so 大丈夫も is used to stress “It’s ok”? も is according to what I know means also. Is there other usages for it? Is there a lesson on it? I have a lesson on も Check this link. And yes, I have a lesson on ている　Click here. I don’t understand this sentence at all. Here what is から、もの？もの no kanji? What is the function of “か” here? In this sentence, we talk about looks or personality? 1. I guess you use kanji in old saying but if it is not something tangible you use hiragana in general. You can use both このごろ/最近 for some ongoing actions. 4. Could be both. You can tell by the context. Thank you so much for your answers. And thank you for correcting me. I will check these lessons soon. ずるずると10年　remain certain state for 10 years without trying to change something or do something new. That is so nice of you, Kuroineko! 1.”マジ卍” I heard this is very rude to say when we talk to people (daily conversation) among friends, family, etc. Is it true? Also is it true this word is for teenagers only? 寒い中= Originally it had particles but they were omitted? What is this ね at the end of the sentence? 4. “自分で言うのもなんだけど、 僕は、頭がいいだけじゃなくてかっこいいよね”. What is the function of のも here? Double particles? btw, is there a lesson on double particles? 1. Not rude but this slang word could be out of date by the end of this year. Yes, it is mainly for teenagers so I bet many Japanese people have never heard that word. 2. That is not just for men. Women can use it, too. ぞ is a literal suffix to emphasize the meaning so it may sound a bit dramatic. も is a particle to stress the meaning.